A38KC Belt. UltraPower® AG V-Belt (Kevlar Covered). 1/2" Wide, 38” Length | Gates 6840 | Campbell-Hausfeld Belt BT-4, BT4 MTD/Cub Cadet. Home > Light Duty V Belts > FHP V Belts. 2L through 5L Sections... > 4L Light Duty V-Belts (FHP) 4L Sections - CLICK HERE! > 4L400 FHP V-Belt - Consumer Brand. > A38 Power King V Belt. Classical A38 Industrial V-Belt. > A38KC Belt. UltraPower AG V-Belt A38-KC (Kevlar Cover). A38KC Belt. 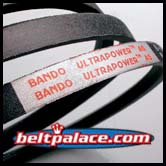 UltraPower® AG V-Belt (Kevlar Covered). 1/2" Wide, 40” Length OC (1016mm). 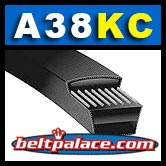 Replaces Standard, Raw edge A34, 4L400 FHP V-Belts. Kevlar wrapped replacement for standard A38 V-BELT. Features bias cut, cross woven Kevlar fabric cover. Superior performance on heavy clutching applications for Ag and Lawn Care machines. One tough belt! Campbell-Hausfeld Belt BT-4, BT4 MTD/Cub Cadet. Belt# 050477 Lesco, 100230 Toro/Wheel Horse belt, 10109 Snapper Belt.